Premium quality 1 litre hand pump sprayer. Manufactured for use with most oils, weed killers, brake cleaners and solvents. Viton® seals allow use with a wide range of semi volatile chemicals that would deteriorate standard seals. Safety valve with depressurization option. Wide filling mouth (60mm) for easy refilling and reduced spillage. Translucent tank allows easy measurement of contents using the side level indicator. Supplied with adjustable 'cone' nozzle, allowing easy and precise application of liquid. Robust composite construction, with ergonomic pump and handle. 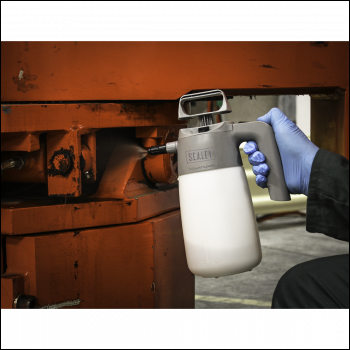 Suitable for use with most oils, weed killers, brake cleaners and solvents. Viton® seals allow use with a wide range of semi volatile chemicals that would deteriorate standard seals. Safety valve with depressurization option. 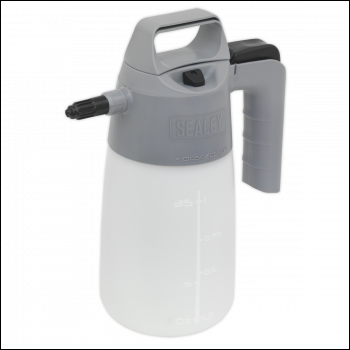 Wide filling mouth (60mm) for easy refilling and reduced spillage. Translucent tank allows easy measuring of contents using side level indicator. 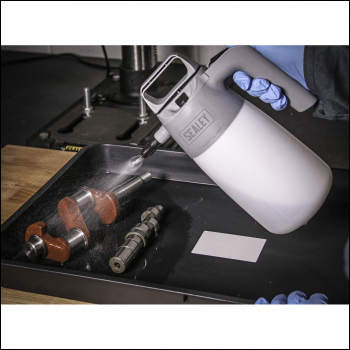 Adjustable cone nozzle for easy and precise application. Robust composite construction and ergonomic design.